According to an interim feasibility report submitted by the Japanese International Cooperation Agency, the Mumbai-Ahmedabad high-speed train corridor will cost at least Rs 90,000 crore (Rs 900 billion), 43 per cent more than estimated by a consortium of RITES, Italferr and Systra in 2010. “The JICA report, too, stated the internal rate of return for the project would be three per cent,” said a railway ministry official. Given such a low return, it may be tough to find domestic investors for the project. “The cost of the project is Rs 70,000 crore (Rs 700 billion) at present. “But the cost at the end of seven years (the time it will take to complete the project), including interest, has been estimated at Rs 90,000 crore,” the official said. With 100 per cent foreign direct investment allowed in projects, the railways are open to offering high-speed train corridors to global players. Sources said foreign investors were stressing on buying equipment from manufacturers based in their countries. “This will limit our choices,” the official pointed out. Officials said the cost of building high-speed tracks was too high for the railways to bear. The capital budget of the railways is about Rs 1,00,000 crore (Rs 1,000 billion) in 2015-16, but the government could face opposition in financing the project. “If it is financed entirely by the railways, states that do not benefit may oppose the project,” the railway official said. States through which high-speed trains pass might have to be persuaded to invest, he added. 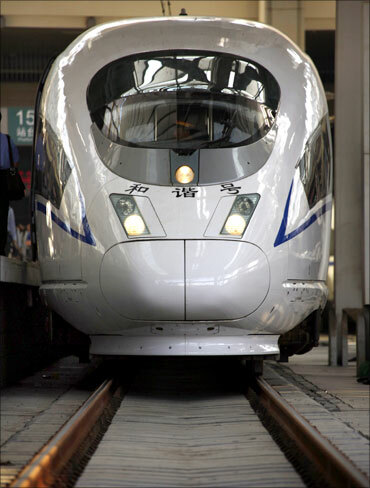 High-speed trains are not a new concept for the railways. “Various feasibility studies have been conducted in the last 25 years. But the cost of the projects led the railways to drop plans,” another railway official said. “IRR is not the right measure for a high-speed train or metro rail,” said Arvind Mahajan, partner and head of infrastructure and government services at KPMG. Productivity gains, the environmental impact, and technology transfer must be considered too, he added. JICA estimated the cost per km for the Mumbai-Ahmedabad line would be over Rs 168 crore (Rs 1.68 billion). Railway officials said it would cost much less to upgrade existing tracks for trains running at over 160 km an hour. In 2010, the last full-term report by RITES on the Mumbai-Ahmedabad high-speed track estimated the cost at Rs 63,000 crore (Rs 630 billion), or over Rs 100 crore (Rs 1 billion) per km. Bullet trains in India: Fast track to nowhere?